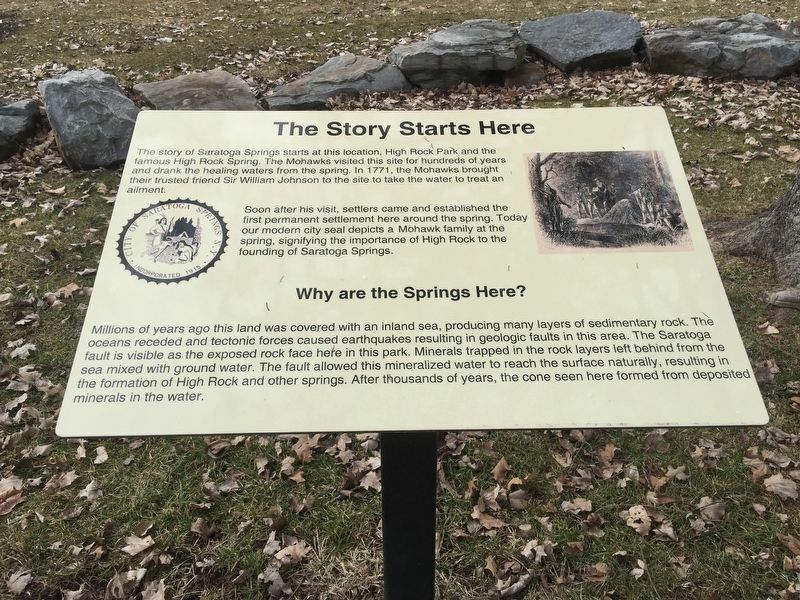 The story of Saratoga Springs starts at this location, High Rock Park and the famous High Rock Spring. The Mohawks visited this site for hundreds of years and drank the healing waters from the spring. In 1771, the Mohawks brought their trusted friend Sir William Johnson to the site to take the water to treat an ailment. Soon after his visit, settlers came and established the first permanent settlement here around the spring. Today our modern city seal depicts a Mohawk family at the spring, signifying the importance of High Rock to the founding of Saratoga Springs. Why are the Springs Here? Millions of years ago this land was covered with an inland sea, producing many layers of sedimentary rock. The oceans receded and tectonic forces caused earthquakes resulting in geologic faults in this area. The Saratoga fault is visible as the exposed rock face here in this park. Minerals trapped in the rock layers left behind from the sea mixed with ground water. The fault allowed this mineralized water to reach the surface naturally, resulting in the formation of High Rock and other springs. After thousands of years, the cone seen here formed from deposited minerals in the water. Location. 43° 5.211′ N, 73° 46.814′ W. Marker is in Saratoga Springs, New York, in Saratoga County. Marker is on High Rock Avenue, on the left when traveling east. Touch for map. Marker is in this post office area: Saratoga Springs NY 12866, United States of America. Touch for directions. Other nearby markers. At least 8 other markers are within walking distance of this marker. High Rock in the 1800’s (a few steps from this marker); Creation of the Park (a few steps from this marker); Saratoga’s First Resort for Travelers (within shouting distance of this marker); Highrock Park (within shouting distance of this marker); Bryan Home (within shouting distance of this marker); Standard Time (approx. 0.4 miles away); New York State County Highway Superintendents Association (approx. 0.4 miles away); Franklin Square (approx. half a mile away). Touch for a list and map of all markers in Saratoga Springs. More. Search the internet for The Story Starts Here. Credits. This page was last revised on April 1, 2019. This page originally submitted on March 29, 2019, by Steve Stoessel of Niskayuna, New York. This page has been viewed 29 times since then. Photo 1. submitted on March 29, 2019, by Steve Stoessel of Niskayuna, New York. • Bill Pfingsten was the editor who published this page.